Canon MF229dw – What would the world be without color? Boring, that’s what. That’s why printer adverts are full of splotches and splashes and rainbows. It’s a brilliant selling point. And we do mean selling. If printer makers had a pound for every single one of the 16.7 million colors they can reproduce… oh, wait – they do. There’s another way to look at this what would your favorite novel be without color? Exactly the same. There’s nothing wrong with black text on a white page, and that’s what many people require to print. Choose a black-and-white laser printer, and you’ll get faster, crisper output with lower running costs – important when you see the frankly terrifying prices of color laser toner cartridges. It prints quickly and crisply – and won’t cost a fortune to run. 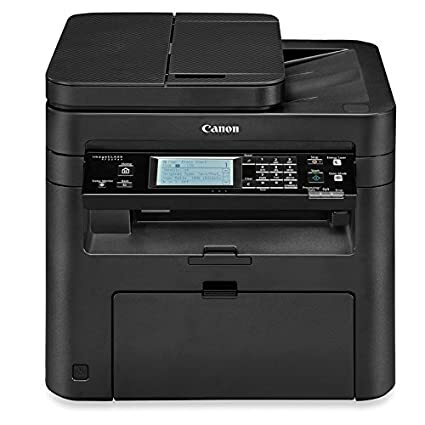 So an affordable mono laser printer like the i-Sensys Canon MF229dw may not seem terribly exciting, but it shouldn’t be overlooked. This particular model has the extra features you’d expect from a modern multi-function device, including built-in Wi-Fi with Apple AirPrint and Android Mopria and a scanner under the lid topped by a 50-sheet automatic document feeder (ADF). While it’s bulkier than the average inkjet printer, it doesn’t take up too much desk space. A touchscreen makes it easy to operate. Although you can only print and copy in black and white, the scanner works in full color, and delivered very clean and detailed images to our PC. At 28 seconds for an A4 greyscale page at 200dpi, or 10 pages from the ADF in 87 seconds, it’s not fast. You can scan, copy and print both sides of the paper, though, which is a time and cost saver in itself. When it came to the all-important text output, our 20-page test document sped out at 22.4 pages per minute (ppm), and throwing in some greyscale graphics only slowed it to a creditable 16.9ppm, although the results looked predictably grainy. Few inkjet printers can match that – and they cost more. At around 2.2p per page, running costs beat rival laser printers, although one or two inkjets do work out cheaper for black-only pages. You could buy a color laser multifunction printer such as the Lexmark CX310dn for even less money – but think twice. The CX310dn isn’t designed as a black-only printer, and will therefore cycle the color toners to keep the mechanism working. So even if you only printed black, you’d eventually need to replace the color toners.